He read Modern History at Oxford, he’s won BBC and MOBO awards, received a Mercury Prize nomination (jazz musicians don’t win the Mercury), presents BBC Radio 3’s late night Jazz Now programme, confronts the politics of the music business (the EP War in a Rack a case in point), records albums and tours the world. DJazz wondered if he was up for a headline gig in Durham Miners’ Hall. He was, he came, he conquered. DJazz is in its second year, tickets were selling well. 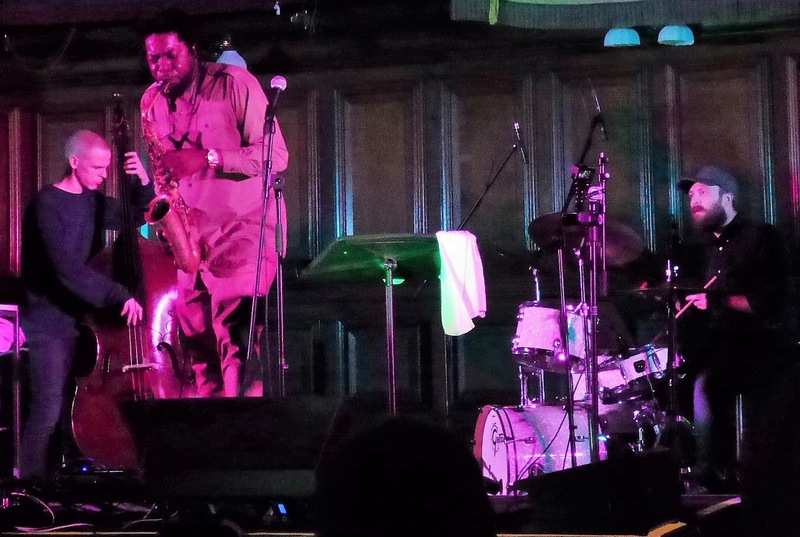 The news that Soweto Kinch would be the headline attraction ensured the festival would sell out. And so it did. A rainswept early Saturday evening didn’t deter the hordes as they made their way up Flass Street to the DMA. The Durham Miners’ Association HQ stands in its own grounds, boasting the ‘Pitman’s Parliament’ or Durham Miners’ Hall as it is more formally known. The audience (perhaps that should be ‘delegates’) sat row upon row ready to engage – musically, and for some, politically – with Soweto Kinch. Alto sax, Apple Mac, pedal board…the everyday hardware of the twenty-first century musician, a far cry from the days of the non-electric practitioner some one hundred years ago. Kinch played material from his CD Nonagram. The album’s title refers to time signatures, mathematics and… don’t worry if your head hurts at the prospect of equations and such like, simply enjoy the music. You will enjoy it, Kinch’s alto sax playing isn’t for the faint-hearted, he goes for the jugular, grabs hold and doesn’t let go. Coruscating alto lines hot plate welded to a hip-hop beat keep on coming, resistance is futile, sit back and take it! Centricity to Nostalgia and on to Mitosis then Montpellier, Kinch played with cast iron authority, he’s been doing this professionally for over twenty years. On this DJazz gig were regular bassist Nick Jurd and the razor-sharp drummer Will Glaser. Their role was to anchor the hip-hop beat, steering a steady course for Kinch to explore; upper register, lower register, filtered laptop loops, then the poetry. Soweto Kinch’s party piece required the on-side crowd’s participation in a freestyle rap. DURHAM suggested Kinch, asking the audience to shout out a word beginning with D. Only in Geordieland could someone bellow DIVINT! Meaning DO NOT, Kinch got it. Next U…UNITY…Kinch liked the solidarity angle, RAIN, topical, H...again only in Geordieland…HOWAY! Again Kinch got it…COME ON or COME ALONG. A, ANARCHY, our altoist was in his element. Finally M…MAJESTIC. 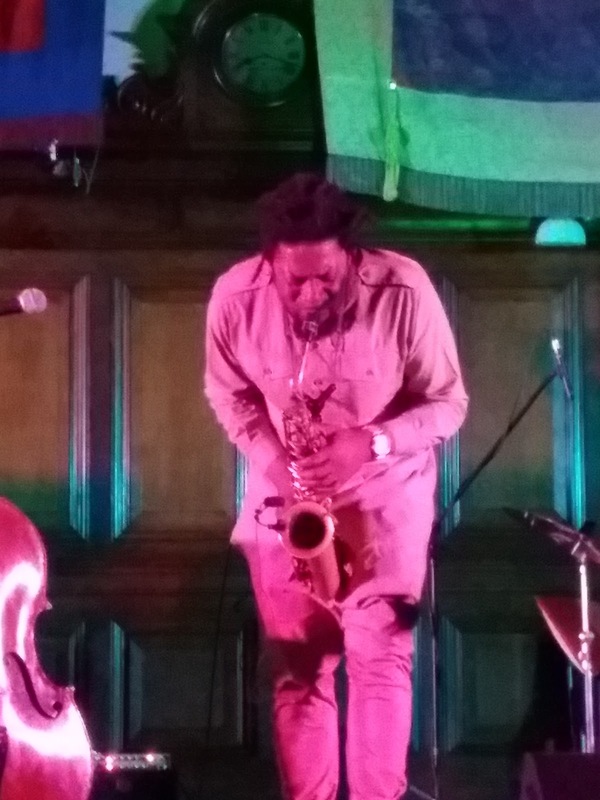 A smiling Soweto Kinch looked around the audience, knowing he could do it. To another killer hip-hop beat, Kinch, the freestyling rapper, went for it and, sure enough, seamlessly incorporated the words into his rap. Quick-witted is Kinch, his alto playing ain’t half bad either, a worthy headliner at DJazz The Durham City Jazz Festival.